Cuban and Mexican authorities signed on Thursday in Havana, three scientific-technical and academic cooperation agreements in the health sector which will allow expanding and strengthening bilateral ties in the field. Dr. Roberto Morales Ojeda, Cuba’s Health Minister signed an agreement with Jose Reyes Baeza, Director of the Security and Social Services Institute of the State of Mexico. The agreement includes hospital assistance, administration in health systems, training of human resources, timely detection of chronic-degenerate illness and prevention in issues related with obesity. Morales Ojeda and Mikel Arriola, General Director of the Mexican Social Security Institute signed a second document for the exchange of knowledge and research in sciences and techniques among other aspects. Authorities of the International Neurological Restoration Centers (CIREN) and the Mexican entity signed an agreement for the joint development of basic, clinical and public health care projects and the participation in courses, congresses and consultations organized by both sides. The accord includes research in neurological restoration and optimizing human resources and the infrastructure of the neuroscience services with special emphasis in functional neurosurgery and stereotactic. The agreement was signed by Dr. Tania Margarita Cruz, Director of CIREN and Jose Reyes Baeza, Director of the ISSSTE and contemplates the minimum access procedures for the treatment of Parkinson, epilepsy, child autism and psychiatric ailments. 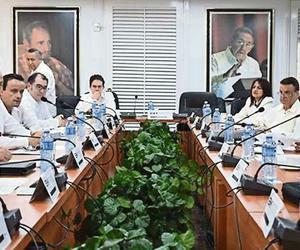 In statements to the press, Narro Robles expressed interest in favoring an exchange of experience between medical colleagues and gain knowledge in the development of Cuban medicine and health system, which we appreciate in a very special manner, she said. We want to advance and strengthen commercial exchanges and the development of joint programs in the pharmaceutical industry, she added. Morales Ojeda said that the signing of the documents is a good opportunity to continue developing bilateral cooperation in the sector with security that it will contribute in improving the health systems of both countries and quality of life of the population. During the Mexican health specialist’s visit to the island, which will conclude on Saturday, the Mexican delegation will visit the Center for Molecular Immunology and Genetic and Biotechnology Institute.